I have posted various post of MPLS TE and everytime I receive the question why and when mpls ip is used in TE tunnel. In this post I would like to conclude when, where and why mpls ip is used in TE tunnel. 1. 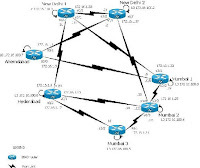 If the MP-iBGP and Tunnel destinations are different, mpls ip command is required. 2. If the MPLS TE terminates at the egress PE, no ldp/tdp is required. 3. If the MPLS TE terminates before the PE router or egress router, tag switching is required (three labels are used). I have posted loopback summarization is possible but few days back I have seen a draft where in one new model is proposed. The draft has shown the use of aggregate FEC which helps to achieve the loopback summarization. We always talk about three labels in MPLS but honestly have never ever seen three labels before this post. Three labels usually not seen in a single service provider domain, routers always have two label stack one for VPNv4 and another is for IGP. But in MPLS TE, we have three label stack and definitely it will lead to problems in case of Fast Ethernet because MTU size will be going to change. But if the core is having Gigabyte Ethernet interfaces then no one will screw the happiness of the network. As described in my previous post, everything is same except the termination of the head end tunnel. Previously it was on Mumbai 1 now it is on Mumbai 2. But the vrf which need to be communicated is at Mumbai 1 router. So simply I was terminating the tunnel one hop previous to the egress router. While going from home to office and back to home sometimes on same roads lead an excessive time. Everyone want to reach before time so that need to opt any other alternate path which may be long from the regular one. The same fundamental works in networks also. OSPF,EIGRP and BGP are used to manipulate the change the traffic from one path to another. Like in OSPF cost is used to change the path, in EIGRP metric is used and in BGP many attributes like weight,local preference and as-path are used. The problem with all the protocols is that unequal cost load balancing is not possible except EIGRP supports this feature. In regular topology of service providers, two links are used one for primary and another is for secondary. Many cases the latter path remains empty and unnecessary increasing the capex of the company. With addition to this, to achieve the SLA parameters for esteemed clients, SP need to reroute the traffic of some VPN on the secondary path. For this PBR is used but its very difficult to add the static routes at each and every router in the hop. For all the problems MPLS TE is the best optimum solution for reroute the traffic on VPN basics. With this case study, all the VPNs will follow the normal path but the one will follow the secondary path which is not used by anyone. The topology is hypothetical model of service provider cloud which servers the MPLS VPN services its customers. New Delhi 2 router is acting as RR and New Delhi1, Hyderabad and Mumbai 1 are acting as PE. All the routers are part of area 0. New Delhi1 ,Hyderabad and Mumbai1 routers are serving two vpns one is TEST and another is TEST1. By default from New Delhi 1 to Mumbai 1 the traffic is routed via directly connected link between the two. But for some specific requirement of vpn TEST, its traffic will follow the new path New Delhi1 → Hyderabad → Mumbai 2 → Mumbai 1. To achieve the objective MPLS TE is used with static routes and RSVP is used for reserving the bandwidth of 200 Kbps on per interfaces. Now SP want to change the traffic of VRF TEST via Delhi1 → Hyderabadhttp://www.blogger.com/img/blank.gif → Mumbai 2 → Mumbai 1.. To acomplish the task TE tunnel is created. With TE a bgp next-hop attribute is used with in the vrf and a static route is imposed on the headend router for this loopback. By doing this all the VRF TEST routes will come with the new loopback instead of MP-iBGP loopback as next hop. The static route will forward the traffic within the tunnel where the destination will be the new loopback. MPLS TE tunnels are unidirectional. So new loopback is created at Mumbai1. Figure 2 depicted the output of show ip cef vrf TEST command which is explicitly states that 172.16.100.100 is used as next hop which is loopback 500 on Mumbai 1. 32 is the IG label and 33 is the vpnv4 label. So throughout the path IGP label will be changed. The above figure 3 depicted that tunnel 100 is using label 32 for outgoing with serial 0/0 as outgoing interface. At Hyderabad end this 32 should be the local label and have mapped some outgoing label for forwarding. Figure 5 depicts the output of local label 32 which is used in figure 3 as outgoing. After reaching hyderabd PE 32 becomes the local label and swapped with 29. Next output depicts that Mumbai 2 is having 29 as local label and pop tag is used for PHP. Figure 6 depicts that 29 is used as local and further PHP is used for Mumbai 1. Figure 7 depicts that vrf TEST is following the alternate path. Figure 8 depicts that vrf TEST1 is following the directly connected path. Service Providers are looking to divert some vpns traffic on redundant part so as so utilize the links and provide priority to delay sensitive traffic. MPLS TE is the best tool to use this.